Ooh, all of you lucky dogs out there are getting a sneak peek! I’ve been working on (well, not so much working on as, mostly thinking about) a new big project for the art show coming up June 7th. Here’s a first glimpse at HERO CAPS…the future of uncollectable collectibles. 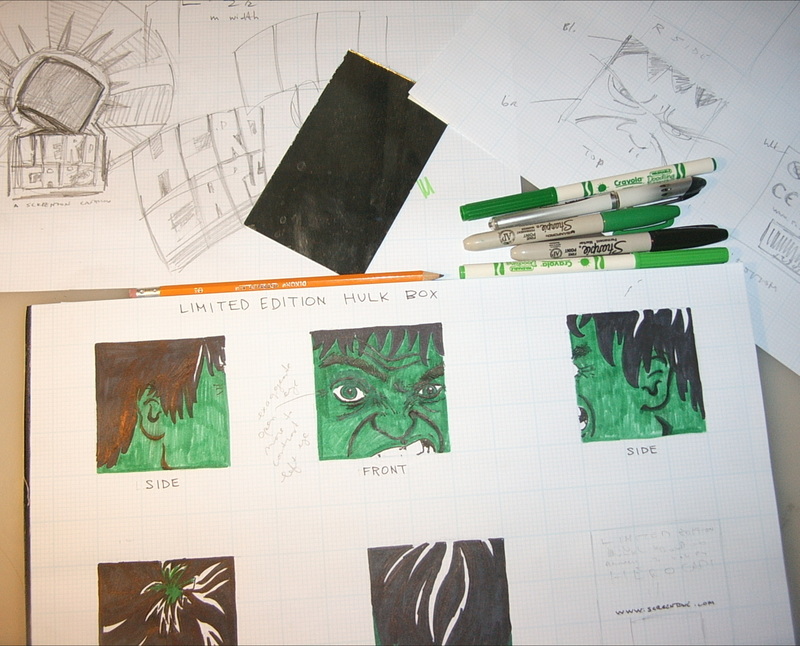 Don’t tell anyone, but this is a glimpse at the artwork for the limited edition ultra-rare Hulk Box. Just one of a kind. It won’t be like any other Hero Caps box! You can click on the picture for a closer look, you know, if you’d like. Oh, and if you’re wondering why it is you’ve never heard of a Hero Cap, it’s because I invented it! My buddy Ryan came up with the name, and my pal Donnie (of penguin fame) helped shape the first Hero Cap with a precision-dependent heating system. Boy, I can’t wait till I’m all done creating them. They’re the perfect collectible for keeping in the box!